If you had asked me a year go what's the one thing that brings me more pure, unadulterated joy than a wedge of cheese, I would have answered without hesitation, "Successfully evading requests to put me in front of the camera for a marketing video." Why? As much as I love the spotlight, I've never felt comfortable being on video. Instead, whenever someone would turn the camera lens my way, I would immediately feel self-conscious and hyper-aware of everything that was "wrong" about me, and want to crawl back into my content cave. There, I'm surrounded by safe things like words, punctuation, and my beloved headphones that protect me from the rest of this cruel, cruel world. Over the past year, I've learned how critical video is if you want to bring people together across great distances -- whether that's within the context of marketing or sales, or collaborating with colleagues who work remotely. So, that's why I've set aside my personal issues and fears and made it my mission in the past 12 or so months to be more at-home in front of a camera. It hasn't been easy, and I definitely still get nervous. But I do have a few tips and tricks I want to share with you today that may help you in your quest to become a video marketing superstar. One of the quickest ways for me to feel uncomfortable in any situation is when I neglect my appearance -- maybe I was feeling lazy and didn't dress up as much as I should have, or my hair could have probably used an extra brushing. Or worse, when I invite people over, and I'm tidying up as they're walking through the door. Am I dressed appropriately for the occasion and putting my best foot forward? Do I feel comfortable in what I'm wearing and how I look? Is there anything I should clean up or arrange before I turn on the camera? Not only do I feel more confident about being on camera, I'll also look comfortable, polished, and professional to those watching my video. Even if it's a casual video and it's not easy to spot what setup I may have done to prep for it, you'd be surprised how addressing those three questions can go a long way toward making your video a success. Video works because it fosters authentic, human-to-human connections. So, if you rehearse what you're going to say too much, you'll sound scripted and insincere. That's not to say, however, that you shouldn't plan. Personally, I'm not comfortable getting up in front of a camera and speaking entirely off-the-cuff. (I'll leave that to the Chris Dupreys of the world.) So, before I get in front of the camera, I'll write down what I want to say. Because I'm a writer by trade, my notes tend to read like a script, but I really just use them as a guide so I make sure I know what I want to say and in what order. I'll skim it once or twice -- but I won't rehearse it -- and then I'll go to film myself for my video. I know a few folks who say their version of this is just writing down a couple of bullet points in order, so they know what they want to go over. To be completely transparent here, I should point I don't do a ton of long videos, so I might do a little more rehearsing in those scenarios. That said, I've found for short videos -- especially conversational ones -- the less I focus on sounding perfect and the more I put the concept of "memorizing lines" completely out of my mind, the better and more sincere my final results are. This is one of the first pieces of advice Zach Basner, the mastermind behind our on-site video marketing trainings for teams, ever gave me about being on camera. "If you make a mistake, push through and keep going. Don't stop." It took me a long time to get used to this, because I had a natural urge to stop and do another take. But the more takes you do, the more mistakes you'll make, and the more scripted you'll sound and less natural you'll appear. It's really hard to wipe the anxiety of the desire to get something right on the 13th try off your face with a smile. Now, I lean into those natural breaks. I'll try to riff of them. Or, sometimes, I'll throw in a, "Well, you know what I'm trying to say here," with a smile and a laugh, and then restate my idea. Stumbles are natural and unavoidable. It's kind of like getting used to falling down in football. The person (or people) watching you are seeking a genuine connection with a real human being -- whether they realize it or not -- and those moments can help to humanize you. Remember, scripted robots may sound perfect, but they don't do a great job at sounding authentic. Of course, there's a difference between small verbal missteps and completely blowing a take and needing to give it another go. And needing another take is not the sign that you're a failure -- let me tell you, our own internal blooper reels are hilarious. All I'm saying is don't yell "Cut!" because of a confused word or stutter. Smile, lean into being a human, push through, and keep going. And if you really need a couple of takes, don't do a bunch in a row. Give it a few tries and then come back to it later when it feels fresh, like the first time, again. This is a tip I learned from Myriah Anderson, who is the human equivalent of sunshine and dominates the video game over on our sales team. By starting with a smile before you hit record -- or if you're using Vidyard GoVideo or Wistia Soapbox, when the 3-2-1 countdown starts before the actual recording begins -- you avoid having that awkward one- to two-second expression lag, where your grouchy face catches up to the fact that you're on camera and you need to smile. In that moment, you're literally letting people see you put a happy mask on before you talk to them. We all do it, but when you see someone else do it on video, it can leave a not-so-great impression. Another great way to create a welcoming atmosphere is to pair your warm smile with giving yourself permission to talk with your hands, as you would normally. I don't know about you guys, but when I first started going in front of the camera, my posture was rigid. And given that I'm a naturally fidgety person, I overcompensated by keeping my hands at my sides and not moving at all. As a result, I came off as stiff and insincere. By allowing myself to embrace my communication style of gesturing with both hands as I talk, I started to feel a lot more comfortable as I was talking on video right away. It also enabled me to show emotion and be excited about topics as I was talking through them. The benefit here is that those who smile naturally and practice open body language -- like gesturing and talking with your hands -- communicate an open and honest posture that builds trust. You're showing that you're willing to be vulnerable, relaxed, and very much yourself with your audience. Also, whenever I watch a marketing video where someone is naturally exuberant, and shows passion and excitement -- whether it's just to me or designed for a big audience -- I can't help but catch that feeling, too. It's infectious. I'll keep this last tip short and sweet... ish. Using myself as an example, I now make it a point to use Vidyard GoVideo whenever I can (and when it makes sense) to send messages to individual contributors and share team updates via email or Slack. To keep my habit up and my skills sharp, I also use GoVideo outside of work. For instance, I chair the Communications Committee for Junior League of Annapolis, and I used it just this week to send out motivational messages to my committee during our annual Giving Tuesday fundraiser. 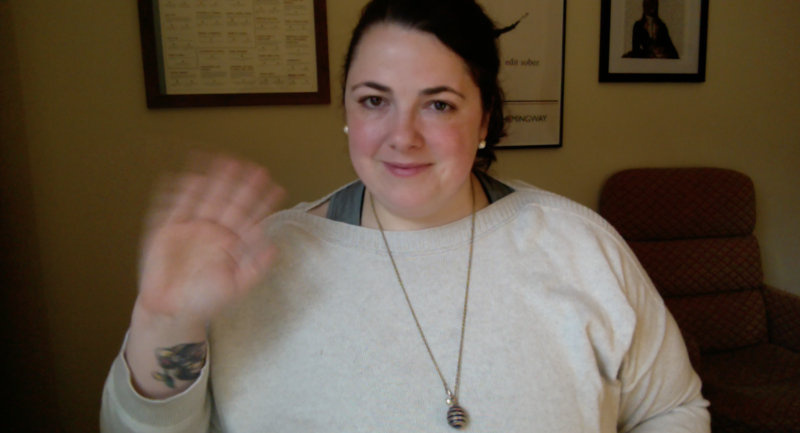 By challenging myself to leverage video as often as possible, I find that each time I power up the ol' webcam, the words flow more organically and the best practices become more like a reflex. Again, I'm nowhere near perfect and have a lot of opportunities for improvement, but constantly practicing is drastically shortening my video learning curve. Finally, Know Your Audience & "Read the Room"
I want to end on this note, because if you remember nothing else from this article, let it be this -- and it's not so much a tip as it is a mindset you need to adopt. Your video's success will ride or die based on your ability to understand who you're speaking to and what they need, as well as the context in which your message will be delivered. For example, in a one-to-one live conversation that takes place over a video conferencing application, you won't want to come in smiling like crazy and being super enthusiastic right out of the gate. You'll want to be warm and friendly and welcoming, of course, but you'll probably want to take a minute or two to gauge a person's energy level so you can match it and put them at ease. Or, when making a recorded video -- either to one person or many -- you'll want to pause and think first about who your audience is, what they need from you, and how you want them to feel after watching your video. The vast majority of the decisions I make about a video happen during the conversations I have with myself about who my target audience and what will resonate best with them, before I write down any talking points or plot out what I want to cover in a video. No matter the scenario, if you start with your audience first when working on a video, you're setting yourself up for success. Happy filming!